Telugu Desam MP Galla Jayadev said that the Centre was setting a ‘dangerous precedent’ by reneging on the promises made during the division of the State. VIJAYAWADA: Alleging that the BJP-led NDA government was discriminating against Andhra Pradesh by citing ambiguity in the wording of the AP Reorganisation Act, 2014, Telugu Desam MP Galla Jayadev said that the Centre was setting a ‘dangerous precedent’ by reneging on the promises made during the division of the State. Jayadev fired the opening salvo after his colleague and Vijayawada MP Kesineni Srinivas (Nani) moved the No-Confidence Motion in the Lok Sabha on Friday morning. Jayadev, the TDP’s star during Budget Session, was given 58 minutes to place the State’s grievances before the House, though, initially, the Speaker allotted just 13 minutes for his party. Incidentally, this is also the first time that a first-time MP opened the debate on a No-Confidence Motion in the Lower House. Making full use of the opportunity given to him, the Guntur MP launched a broadside against the Modi’s government right from the word go with a reference to his brother-in-law and Superstar Mahesh Babu’s recent blockbuster ‘Bharat Ane Nenu’, a Tollywood take on current politics, and which emphasises the importance of keeping poll promises. Calling the Modi-Shah regime a government of empty promises, Jayadev said, “The then Prime Minister Manmohan Singh had given six assurances including Special Category Status (SCS). But, the Centre has not implemented any of them. Prime Minister Narendra Modi, do you have any commitment to previous promises? Can we believe that the assurances given by you now will be implemented even if you are not the next PM?” he asked adding that instead of correcting the ambiguous wording, the BJP was a part to the Congress' political plan to divide the State. He further said that the Congress undemocratically sliced Andhra Pradesh into two, and recalled that Modi, who visited the Seemandhra region before becoming the PM, said that the Congress killed the mother and saved the child. “He also said that had he been in that situation, he would also have saved the mother. But, even after four years, Instead, he, through his ministers, denied SCS saying that if AP’s demands exceed the Act, other states would also demand,” he remarked. 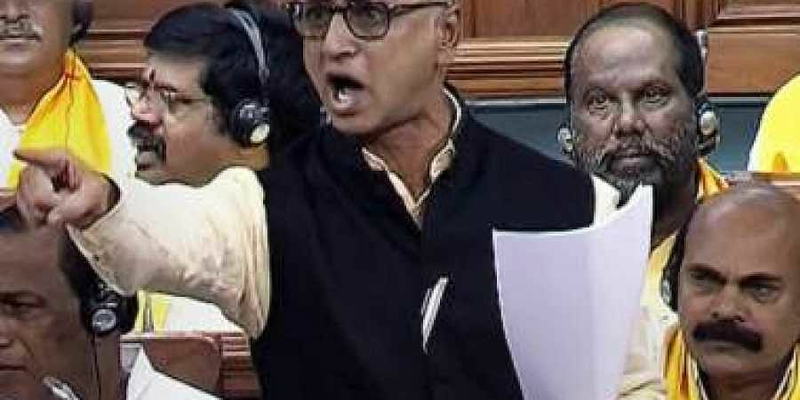 Jayadev’s address was interrupted by TRS MPs, who took objection to calling the bifurcation `undemocratic' and protested in the well of the House. While AP needs Rs 1.4 lakh crore to stand on its feet, the Centre has given only Rs 13,400 crore. “Even the amount given is due to the provisions of the AP Reorganisation Act, and not out of generosity. Does giving 2-3 percent of what we need amount to providing handholding?” he asked. “Saying that the 14th Finance Commission did not recommend SCS is a conceptual blunder as the Constitution provides Parliament the right to take decisions,” he observed. Jayadev also placed on record that the members of the 14th Finance Commission categorically stated that they recommended against the accordance of SCS to AP. He also clarified that the TDP always wanted SCS and denied that the party’s president and AP CM Chandrababu Naidu took a U-turn as alleged by the BJP and Opposition parties. Jayadev also accused the BJP of discriminating against the AP only after the TDP severed ties with the NDA, and added that the saffron party was now getting close to the rivals of the TDP. “The YSRC is now on the guest list of PM Modi and BJP national president Amit Shah,” he alleged. Stating that the TDP does not want the clock turned back, he said that the entire State only requests justice be done to it. While Jayadev spoke about the SCS and finance issues, MP K Ram Mohan Naidu was prepared to talk about infrastructure and other aspects. However, Lok Sabha speaker Sumitra Mahajan did not give a chance to the Srikakulam MP. While the TDP MPs requested for more time, amid din in the House, one of the TDP MPs called PM Modi a ‘mosagadu’ (cheater). Reacting strongly to this, Defence Minister Nirmala Sitharaman demanded that the word be expunged from the records. Congress President Rahul Gandhi, who had promised to make the first signature on the file of SCS to AP if his party claimed power in 2019, devoted hardly a minute to it in the Lok Sabha on Friday. “In Galla’s speech I sensed a deep feeling of pain. I want to tell that you (AP) are a victim of the 21st century political weapon called Jhumla Strike. You are not alone, and there are many other states in the country” he said, referring to Galla Jayadev’s address. The Guntur MP’s speech received mixed reactions on social media platforms. While some appreciated Jayadev’s speech for driving the point effectively, a few others trolled him for being ill prepared for one of the most important sessions.